It was a 87 perfect degrees in New York City today and I spied an actual pumpkin at the farmers market. I love this time of year, when you expect it to feel like fall but it decidedly does not; it’s like Bonus Summer: cool enough to bust out cardigans at night but warm enough it feels too soon to audition any of the heavier dishes to come this winter. I’ve been gushing over what Sam Sifton called “valedictory meals” in The New York Times Sunday Magazine — “fall dinners pretending to be summer ones” — and I imagine that wedges of focaccia baked with a grape you can only find this time of year, a roasted tomato salad, many formats of cheese and a lush glass of pink wine would nicely fit the bill. Still, it feels blasphemous saying this, given that this is a Claudia Fleming recipe and I adore her baking so, but it really drove me crazy. The dough was too soft, there was more oil/butter in there than even possible to apply (and I’m not one who willingly cuts back on butter in recipes) and have you ever tried to seed a Concord grape? Take a seat, it will be a while. An almost paper-like exterior gives way to a gelatinous center that has no interest or inclination to give up its one to four (4!) seeds. But when all that is done and you pull this from the oven, you might taste the most amazing focaccia you have ever eaten. I know I did. I couldn’t get enough of the sweet/salty/olive oil/grape/rosemary thing with the crisp edges and so much texture, it was nothing like those leaden squares speckled with dry olives you might be used to. I imagine this will go into heavy rotation if we ever start having cocktail parties again. Or cocktails. Cooking this last week also forced me to reconsider something I never thought I’d have to. Warning, a tangent is nigh! One of my greatest pet peeves (and a conversation I encourage you to never start with me, because I just go on and on about how much it “annoys” me until you roll your eyes, or at least that’s what my husband does) is what companies get away with printing on product labels. “A good source of calcium!” “Boosts childrens immunity!” “Fat free!” (Dude, it’s ketchup.) And especially: 100% juice! (Welch’s). Because I had eaten grapes (tons, actually, in the 9 months before this sock monkey thief came along) and they didn’t taste anything like that ridiculousless in the bottle. How do they get away with making such false claims? And then, last week I had my first Concord grape. And guys, it tasted precise like… bottled grape juice (or Kedem, for those of you ushering in 5771 wine-free this week). Have I been wr-r-r- (this word, it hurts) -ong? Is it possible that nutritional claims made on labels might not be universally dubious? Some people read Ayn Rand and suddenly have to reconsider everything they once thought they knew about the world; me, I ate a grape. My mind has been buzzing with this new development, and I pondered it as I ate piece after piece of my focaccia heaven. I’m thinking about making another batch, just so I can “consider” this some more. As I mention above, I tweaked this recipe a lot. I have streamlined several steps, swapped butter with oil (because I’m nuts about the olive oil/sea salt/rosemary combination), used less than she suggested (which, trust me, will not leave this focaccia lacking), swapped powdered milk for a smaller amount of fresh, increased the flour so that the dough is only moderately and not “so sticky that someone who has baked hundreds of breads in her life is going out of her mind” (ahem). What stays, however, is bliss: a gorgeous focaccia that’s begging to served with wine and cheese, preferably on a deck. Do that for me, will ya? P.S. If you want to buy a copy of this utterly fantastic dessert cookbook, one of my favorites, I recommend calling the North Fork Table & Inn, where Fleming now spends her days and asking if you can buy one from their supply. I bought mine there a couple years ago, and they only charge the cover price, unlike many resellers. I would have NEVER thought to add grapes in focaccia. I love all things fruit so this just sounds fabulous to me! I read this title and couldn’t help saying “woah!” I must make this, right now! This is beautiful! Can a food be beautiful? Well, it is! There was this seasonal flatbread at Sullivan Street Bakery last Sunday… flat bread topped with champagne grapes, anise, sugar, and olive oil. A delicious sister to this recipe, no doubt. Yes, concord grapes are yummy! But do you think a seedless grape variety would work here? made your fabulous honey cake again this year, and cannot wait to cut into it tomorrow night. That looks quite amazing. I love reading your thoughts and tangents, too! focaccia with grapes look yum,..
6 tablespoons of oil still sounds like a lot – I wonder how much she asked for in the first place!! What a clever combination! I’m looking forward to trying it! Georgie — It was 7 1/2, 3 1/2 softened (some in the dough, some dotted on at the end) and the rest melted. I forgot to mention that I was barely able to use even the 6 tablespoons. You might end up using closer to 5. And I wasn’t trying in any way to cut back; I think olive oil is essential to good focaccia. I just literally could not slick any more on the surface. Anna — Thanks, because this is probably the most tangent-heavy post in… well, at least since last week. daffy — You can swap any grape you wish. Isn’t that funny about concord grapes? They’re amazing, and totally different from all of the other kinds out there. ‘Fat free’ ketchup is still ridiculous advertising, though (my personal least favorite is Sunny D’s claims of 100% vitamin C. Nothing like corn syrup laced with vitamins to start off your kid’s day!). I love that phrase, “valedictory meal.” I’m pretty sure I’m a valedictory meal too. @Emily: Sullivan Street aka Grandaisy’s is made with champagne grapes. It is so delicious I can’t hardly stand it and I look forward to it every summer. The anise seed is so wonderful with the grapes. Looks GOOOOD! And I’ve missed commenting on your site, so good to be back to reading you. Sounds delicious. I’m thinking I’d like to try this with wine grapes, although they, too, are tough to seed. Trader Joe’s has an unfiltered, pure grape juice, whose ingredient list reads something like “Grapes.” and WOW it’s freakin delicious like a Concord grape is! I see why they’re juiced, with those darn seeds and all! totally agree re: using only olive oil & no butter. sounds more like the focaccia recipe i use. which seedless variety do you think would yield the most similar flavor result? sounds like the perfect sweet-savory flavor mix. can’t wait to try it. Oh. Oh, my. Deb, Deb. Deb. Thank you for bringing me Concord grape heaven. I’ve been staring at these pictures for fifteen minutes now, and I’m still under their spell. But what I want most of all is the Valedictory meal you described. Come hell or high water, it will be mine this weekend! Thanks for giving me the best dinner idea of all time! This sounds and looks SO FRACKING GOOD but I cannot get over having to /seed grapes/. Is there no other way? Do.. do people SELL these grapes seedless? Oh Deb – this may be the first time I am truly missing NYC since we left. Concord grapes haven’t yet shown up in the markets here in SF, and I am not sure if/when they will. I know they are grown more back east, and then quickly purchased by said Welch’s, so I am hoping I can get my finger on some this year. Last year I actually made grape juice (for cocktails anyway) and if I see them soon, this focaccia will surely make my list. Looks divine! …or maybe sub the grapes for some fresh black mission figs. not sure if you get many fresh figs in NYC. here in SF they’re plentiful at the moment. 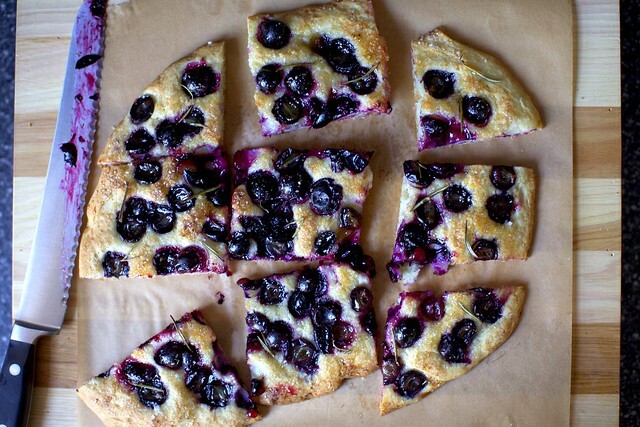 I LOVE concord grapes and have been thinking about making foccacia for a few days now. Oh. It. Is. On. Sounds like you had as much fun making the recipe as you had enjoying it too! Wow. Great idea coupling grapes with rosemary. Beautiful pictures. Your Concord grape discovery cracks me up. Those of us lucky enough to have Concord grapes growing crazily all over the back yard (yes, me!) take the flavor for granted. I’m always surprised when people–especially foodies–don’t know Concord is THE grape of grape flavor fame (doesn’t it say Concord on the juice bottle?). But then, I live in Massachusetts, so we’re supposed to know. It’s OUR grape! Anyhow, this looks lovely, and I’m excited to try it out! I don’t eat grapes. Weird, I know. But this is really, really pretty. This looks fantastic! And I’m with you… pumkins? already? But I do love concord grapes. Seriously, though, is there any way to get around seeding the grapes? Of course not, but seeding concord grapes is no fun! This past week I was lucky enough to find SEEDLESS concord grapes (who knew) at a farmstand near my home. I’ve always loved concord grapes but avoid buying them because I can’t stand the seeds. I can’t wait to try this recipe. This whole grape thing cracks me up. I always wondered where that purple grape flavor came from because none of the grapes I had ever eaten tasted like that. It wasn’t until a couple of years ago that I realized that the flavor comes from actual grapes. Since I live in Nor Cal I doubt I will have the chance to taste the fresh version so I will have to settle for stolen sips of my 3 year old’s juice! Okay, I’m sold! Anything that inspires a pairing with good wine and cheese deserves a try in my kitchen. I adore the way this particular grape leaves purple ink stains that remind me of summer blueberries. My daughter’s friend was telling me about lycopene and he was very surprised that I was already familiar with it. Then he told me he learned about it on a Ketchup bottle. Wow. I never thought to ask if he knew it came from the tomatoes used to make it. We should all question those crazy claims on products to make them seem healthy when we know they are not but really, really want them to be! 100% grape juice is different that just grape juice and it usually doesn’t taste as sweet. Foccacia is something I think about making all the time and never get to it. This recipe sounds intriguing. Metropolitan Bakery in Philadelphia makes a grape focaccia with rosemary and goat cheese that I’ve missed since I moved 12 years ago. You may have finally inspired me to try on my own. Oh, yes. How about figs? That sounds delicious. What a beautiful bread! But if I make this I’m swapping the grapes… I hate Concords. I can’t keep the thought of grape cough syrup/Jolly Ranchers/nasty jellybeans out of my head when I eat them. I can taste it right now. Ugh. I walked to my concord grape vines a few days ago and it SMELLED like grape juice! That’s how I knew I should get picking! I’ve made juice and jam… and THIS is awesome! I was hoping someone would illuminate the path to some sort of baked good with grapes… had to be YOU! Thanks! I wonder what this would be like with blueberries. yum! Wow. I learn so much from this blog. I have always HATED everything “grape” and thought the food processing companies just didn’t get it right. Have to be honest, it doesn’t make me want to eat concord grapes. But, these pictures are too beautiful not to try it out. My mouth is watering. When I lived in Florence, I literally became obsessed with this stuff, it’s everywhere in the fall. Of course the Tuscans refer to it as schiacciata all’uva and is made using the classic Sangiovese grape. In Italy they make it bit thicker than the one you’ve made, but I’ll have to give this recipe a try, rosemary must bring it to a whole other level of decadence! aaaaaaaaaaaaah, i love grapes on foccacia. the sweet/salty/savory is just to die for. figs and apricots are also pretty great. I am glad you are still having some great weather on the East Cost, because here in Seattle it already turned into fall. Yuck! I am so with you on the food comments, but i stopped complaining because nobody listened to me :). Anyways great recipe. I am not a huge focaccia bread person but this looks really good. I saw the pictures through Google Reader and was hoping deep inside it was from “The Last Course…” It is a spectacular book, and an amazing recipe! I’ve only tried making focaccia once and it didn’t turn out very good. It was too bready and not very tender. Probably too much flour. I would never have thought to use grapes on focaccia, especially concord’s because they’re so sweet. I was surprised to read that they weren’t your pickled grapes! Would those work, do you think? I sort of felt that way about Ayn Rand when I first discovered The Fountainhead, but the further I read it the more weirded out I got by her message. Um, no thanks! It would have taken far less time for me to eat a grape than come to this realization. At the farmer’s market here in Santa Monica someone sells seedless concord grapes. They are pretty amazing. Okay, they are absolutely amazing. My kids are less wowed by them- what with their tougher skins (the grapes) and all, but that leaves more jammy wonderful grapyness for me. Can’t wait to hunt down these grapes- may be a few weeks- and try this recipe out. Thanks! Ha, I had that exact same concord grape/grape juice/grape candy epiphany 2 years ago whilst visiting a friend’s farm. I’ve been on a fanatical binge (when in season) ever since. I do have to warn you, however, that eating too many at once does something nuts to the inside of your mouth and will mess you up pineapple-style. How did you know I have been thinking about this bread? I used to buy a grape foccacio with powdered sugar and pine nuts on it that I often dream of and have been thinking about trying to recreate it. I’ve always looked at grape focaccia with a lot of suspicion. Now that it has your stamp of approval, I can’t wait for grape season! I grew up with Concoird grapes and love their taste. While they are still in season, you might try making a Concord Grape Apple Pie. I don’t have a particular recipe to recommend since it’s been a number of years since I’ve made it (I’m West Coast now), but I loved the combo of the sweet grapes and tart apples — it somehow heightens both flavors. Ohh I don’t envy you. Peeling and seeding grapes is torturous to say the least. But how cute would this look with some champagne grapes. Mini focaccia with champagne grapes anyone? Saw this pop up a few times last year, and it looked good then. Still looks good. The color of the grapes seeping into the bread is what looks so cool. I have never added a fruit to my foccacia…. but now I have to! These look so tasty! I knew right away this was from The Last Course! I love it so…I just keep renewing my library copy (3 times so far) and no one has caught on yet. FYI, after I made your/her buttermilk ice cream, I contacted the Inn and got two really sweet and prompt replies from both the innkeeper and Claudia herself saying that they no longer had any copies to sell and the publisher had no interest in reprinting it. It’s the last part that makes me so sad. Digital media, people– how about a copy on the Kindle so I can at least get the recipes if not the gorgeous illustrations?! Kirsten — What a bummer! I had meant to ask if they still had them when we went there for Alex’s birthday in August, but I was too busy sharing a charred steak the size of my then-10 month old. :) Maybe I can sniff around and see if she’s writing another cookbook? Ingrid and others who prefer weights — I’ve added most. Didn’t get the grapes weighed. 87 degrees is lovely weather. good enough for baking without your home feeling like an inferno. this grapey foccacia would be delicious with some riesling, i’d imagine. oh I make a superb foccacia… and this looks like I may be adjusting my own recipe very very very soon. And maybe (we’ll see) I invite a few of the girls to help me drink wine and eat bread. Unfortunately its just rainy and humid here, with plenty of heat, but its not in the hundreds so I’m hanging on my porch a good bit. I’ve been making a similar version of grape focaccia for years (I guess since Gourmet, may she rest in peace, published it in ’01) and love the hints of honey and fermented grapes (here, here for wine at harvest time!) incorporated into the dough. No matter how you tweak it, there’s just something about roasted grapes and sea salt that is simply perfect for this time of year! oh my goodness this sounds utterly amazing, I will DEFINITELY be trying it. I know, so ridiculous advertising such as: made with 10% REAL JUICE! Like we should get excited about that. As usual your photography is lovely! I have not seen grapes that color since eating them off the vines of my grandfather’s vineyard when I was a child. beautiful. in a broader sense, i am *so* with you on the labeling – now everything is “ZERO TRANS FATS!” and it’s like yeah, it’s ketchup, exactly. or whole grains, or antioxidants. Love the color of this dish! So lush! Deb-I grew up on Kedem Grape Juice & my Dad used to bring home a lot of concord grapes (I HATE those seeds!) for us to eat so, yeah, I know exactly what you’re talking about. However, putting grapes on focaccia bread?!? I never would have thought of that. Thanks for the recipe & a Happy & Healthy New Year to you & yours! I would never have thought that grape would be good on focaccia, but the colour is amazing and it looks absolutely scrumptious. Mmmmm. FYI they do NOT seed the grapes. The seeds threw me off at first, but they add a fun crunch. I’ve never had it with rosemary, pan d’uva is more of a dessert here, it’s not meant to be a salty foccaccia thingy. I could get an original recipe from my mother in law if you like. Yum! I discovered grape foccacia last year using local coronation grapes (no seeds!). I also made the discovery that some grapes taste exactly like – wine! (go figure….) I still have some of the grapes and can’t wait to try them with this recipe. You can also freeze your grapes and enjoy grape foccacia in the middle of the winter, a definite treat! This looks incredible–I, like other commenters, would happily add some figs in there as well. And why not a version with peaches and figs? I can only imagine it would be great with the olive oil in the focaccia. Yum! Mmmm, I made this last year (with a lot of tweaks as well) and have been dying to break it out again, now that Concord grapes are back at the market. One suggestion: next time, don’t seed the grapes. Sounds crazy, I know! But it’s so much easier, and the seeds add a nice little crunch to the foccacia. would love to serve this for a dinner party…do you think prepping the day before & refrigerating changes the texture or anything? And you’re totally right about the food labels! They are generally true, to a point. I’ve seen this a few times lately, but after having a horrid grape tart a few years back, haven’t cared to try anything with baked grapes. Although, I love the how crispy yours looks. Everyone (thing) deserves a second chance, right? This looks awesome! I recently went to Cinque Terre, Italy, where pesto and focaccia originated and tried TONS of focaccia varieties. I’ve never had grape though, and can’t wait to try! grapes + foccacia? sounds brilliant! My grandmother used to grow concord grapes, and when I cut her lawn, it would be: cut a strip, grab a handful, spit out seeds, repeat. She used to “fuss” (I believe that was her word) about how she wouldn’t have enough to make jelly and threaten to take it from my pay (which I believe was all of $5 for a HUGE yard). Last week I saw grapes for sale at the end of someone’s driveway and remembered this, but didn’t stop. Now I will be retracing my steps in hopes of remembering said driveway (and believe me, I drive a lot!) and making focaccia in honor of Mom-Mom!! I make a similar dish and use a combination of red and green seedless grapes…looks really nice with the two colours. I also add fresh minced garlic and shallots, sliced very thin and seperated into perfect little rings. Try putting a little dried rosemary in the dough as well. I don’t usually put sugar on top…just a good sprinkling of kosher salt but the sugar sounds interesting and the concord grapes look yummy too! Try the garlic and shallots…it kicks it up another notch! Yum! When I was growing up our next door neighbor had a little grape arbor in the back yard where he grew Concord grapes, There were always some growing off the back fence into the alley at child height. I loved them and looked forward to them every fall. They are the essence of fall to me. Now you may like to try Scuppernong grapes, which I find from time to time at Whole Foods. Happy New Year to you and your family! A propos baking with grapes: I have had success using grapes — even the most commonplace seedless green kind, whole, in any of those cakes where the dough swallows up the fruit as it bakes. This started eons ago with a recipe from “The I Hate to Cook Book” — which seems to enjoying something of a renaissance. The original recipe involved sliced apples. The cake part was so easy to commit to memory — 1, 1, 1, 1, 2 (cup sugar, stick butter, cup self-rising flour, teaspoon vanilla, eggs) that it soon became my “memory cake” (easy to impress your friends when you whip something up without looking!) with endless variations as to fruit and spices. Grapes work well with a bit of nutmeg, brandy instead of vanilla and maybe some almonds sprinkled on top. I love the rosemary with this. I can almost taste it!! Your pictures are truly wonderful! They make me want to reach our and grab a piece! Thanks! Regarding seeding grapes: tweezers. I have a pair with little ridges on the insides that get a really grip on things wet and loosey-goosey. Thanks for another Tasty post! Would love to make this asp, your peach shortbread was unbelievable! Love the taste of brown butter!!! I have never ever seen anything like this recipe! What an awesome and innovative late-summer bread! i would never have thought to add grapes! this sounds incredible! We moved from the Upper West Side to Nowhere, MA (pop. 1400) last fall, and were delighted to find wild concord grapes growing everything in our backyard this summer. I mean, it’s surreal. Clusters of grapes for the plucking have appeared everywhere these past few weeks…. and my first taste of a concord grape, before I spit it out due to skin and seeds, was a shocking and slightly horrified “holy crap, this tastes just like Welch’s grape jelly”. 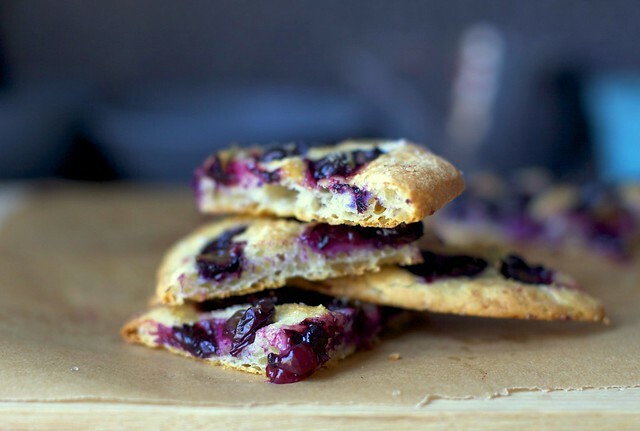 I just read 10-12 different food blogs, and out of all of them, I would most like to have a piece of grape focaccia in front of me right now. I will add a warning, especially for parents: grapes are on the top ten list of produce with the most pesticide. This includes pesticides that are known hormone disruptors and developmental or reproductive toxicants. Buy organic. If seeding a grape isn’t your thing, but love the flavor of a Concord, try a Thomcord grape. It is a cross between a Thompson and Concord, giving the great flavor of the Concord without the seed. These grapes are delish! And the bread looks like the perfect mix of bready, sweet and salty. Robitussin!!! was my first thought, on eating my first Concord! Too weird, too funny. Claudia Fleming’s a standby, and usually totally dependable. I have a batch of 5 minute Artisan foccacia dough in my fridge at the mo … may just give this a go with that little lovely. Valedictory meals, indeed. We’ve got those stuffed tomatoes on queue for tonight. Hopefully cardigans over our t’s, as well. I have been on a quest for a worthy concord rosemary foccacia for years, and my search is recommenced with new vigor every autumn. Thanks for sharing this gem with your alterations, I can’t wait to try it! I have always liked grapes, but disliked anything grape flavored: grape juice, wine(not liking the taste of alcohol either doesn’t help with that one), grape candy. Then I discovered concord grapes, and realized I disliked them just as much as grape flavoring! I guess Homer Simpson was right all along…Purple is a fruit! I had a focaccia bread disaster last year that kept me from trying again but this looks too tempting! I had a similar experience with Concord grapes last summer! I absentmindedly grabbed a sample of one at a farmer’s market, and my mind was blown. So THIS is the taste that all of those horrid grape candies are trying to replicate! I had a terrible focaccia experience recently. I just did a simple parmesan version, and it was too chewy or too untextured or too something. It went into the bin after a few unsatisfactory bites. But this? This looks quite promising! Textured and crispier, and let’s be honest, absolutely gorgeous. I think I will give it another shot! How strange, I was just thinking last week how grapes are almost never used in any kind of baked good. I may just try this! OMG. I have to make this!!!! It looks amazing! But, what really got me to comment… your pet peeve is my pet peeve. Those commercials for Chef Boyardee that claim their beef-a-roni in a can is two servings of vegetables???!!!????!!!???!???!?? WTF? I’ve been following you for years, and love your website. I recently discovered grapes that are a cross between Concord and Thompson seedless. They are called Thomcord I believe. They taste like concord and have tiny little seeds. I’m thinking you wouldn’t have to seed them. They are incredibly sweet and I love the flavor. Thanks for all the great recipes. Deb, you’re entirely correct that nutritional claims are mostly bogus. I’m a dietetics major and as far as my knowledge goes…if there’s a box or package for them to put a claim on, than that’s an indicator that the claim should be taken with a grain of salt. Enrichment is not the same as intrinsic nutritional value. But, yes, concord grapes….the epitome of grape. Concord grapes are grape-flavored? Good to know. I’ve seen so many sweet focaccia recipes lately… looks like I’m going to have to try one out! This sounds fantastic! I luv focaccia…there’s a rusticness about it and with these grapes, so beautiful and right together with the rosemary. that looks so delicious! gonna try it out soon! I was delighted to discover that Amazon has Fleming’s book, listing both new and used (very inexpensive) copies. My apologies if it is not kosher to mention A—–. Your recipe and writing are gorgeous, as always. I was a chef in NYC in the 80’s, and I remember a bakery making a grape focaccia with quite a bit of sugar. It was good, but yours looks fantastic. I only hope I can still get Concord grapes. If not, I might use Muscadines. Some years I manage to make one sour cherry pie and one Concord grape pie–both are fabulous. One year my husband spied the grapes and, sensing a lack of motivation for seeding, surprised me by making grape jam–his first, and sadly, only. I must remind him that it was the BEST ever. Sharon — I’d seen that “New and used” started from $135 or so and gagged — the cover price was $50. I’m bummed to hear that the Inn is out of them, too. Time for her to write another cookbook! This was a great read and a beautiful focaccia! I too, rant about the same thing in my classrom. Advertizers and label makers know that some will believe what they print. Right on sister! This is my kind of food! I love this one. Making homemade grape juice from our garden-grown Concord grapes was a summer tradition with my dad. It was hot, sticky work but that juice was delicious when he would break out a bottle in the middle of the winter. 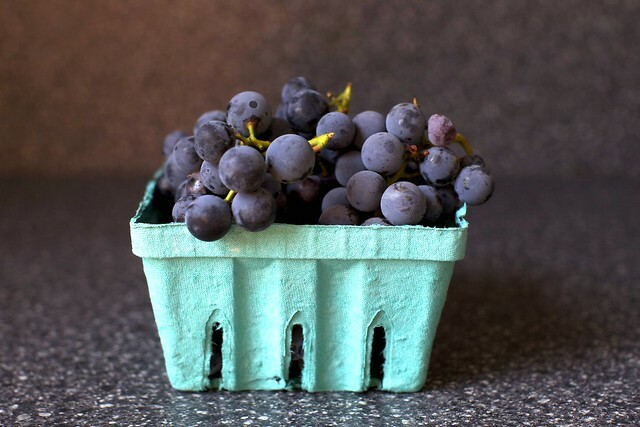 Boston/Cambridge, MA area readers may be interested to know that Silverbrook Farms from Westport, MA is selling seedless Concord grapes right now at various farmer’s markets around the city. I have some on my desk right now, can’t wait to make this recipe with them! I just ordered one for around $9, including shipping–a “very good” used copy. I never have any trouble with their sellers. Used offerings of this book start at about $1.98, plus standard $3.99 shipping. Sharon — Great to hear! What a strange and cool idea! If I weren’t making apple cake for Rosh Hashana I swear I’d be making this. This must sound very random, but i really like the way your berries and grapes come in these beautiful little blue cartons. Ours usually come in plastic bags or transparent plastic boxes here in Hong Kong. Less pretty and much less environmentally friendly…hmph! I generally prefer a slightly thicker focaccia. I think I’ll try my own variation of this recipe. I DO have some concord grapes growing away on the vine. This looks fantastic. I love the idea of using real grapes instead of raisins (love grapes. hate raisins). I’ve never had concord grapes, though! They look pretty amazing! The pictures look great, but I couldn’t keep reading past “87 degrees” while it’s maybe 60 and pouring rain in Seattle. Think it will just as tasty with the pitter-patter of rain in the background? Alas, maybe next year we’ll get a “real” summer again. oooh I’ve been wanting to try a focaccia bread recipe. Never thought to add a fruit to it, but that’s a great idea! And it looks so pretty too! Beautiful descriptive words and photos! I have printed this recipe out and am thinking of trying it with some of the blueberries I canned; really I just don’t want to seed concord grapes. I’ve made a similar recipe for years. It’s one of my most favorites! Happy New Year Deb! I like to think of this as a killer version of Manischevitz Foccacia! Becca — “Manischevitz Foccacia” totally made my day. You do things with grapes that I never do (with grapes). It’s like dessert and a side dish all in one. Looks so freaking good. Wiping drool off screen. Dude, I grew up in Poland, where Concord grapes were all there was. When I moved to the US, I was appalled at what passed for “grapes” here–they tasted nothing like the beloved fruit of my childhood. With the US food scene finally catching up to that of other places, it’s so wonderful to finally have access to these foods again. I’m hoping that wild strawberries will be reintroduced to the American diet next! OMG it feels like fall here in MN! Yuck! I just wrote today that I wanted my 90 degrees back! hahha….I love Rosemary bread and am very curious about the grapes with it. We have vineyards here during apple picking time, so when I go pick apples I will be getting some grapes too for this! This looks divine! What an interesting combination of ingredients…but then not really when I think of wine and rosemary bread. Can’t wait to try it. Thank you! What an engaging post, Deb. You’re more patient than I so I’m considering making with another fruit but most are too juicy. Saw above, figs and apricots. Black seedless grapes perhaps? Otherwise I’ll wait for those seedless Concords mentioned above to hit here in FL someday! Concords were the grapes of my childhood in N. Ohio when we’d get them by the peck. Now never seen but a 1/4 of a bushel I believe. In Toronto we have “Coronation” grapes at the farmers market and grocery store this time of year. They taste just like concord…but are SEEDLESS! No need to seed. This is a great recipe and much easier with Coronation grapes if you can find them. Thanks for taking all the butter/skim milk powder etc out of the recipe, which would have stopped me from trying! Wow, what a crazy combination! Something I never would have thought of but I bet it’s just great. I don’t mind grape seeds, myself, but I loathe the skins. Like, I either peel grapes before eating them or spit the skins out. It’s the sourness. Does the cooking improve them? The most awesome grapes I ever had were Charantais ones, in France two Novembers ago. OMG. Me too! I always thought the “grape” flavour was artificial or enhanced somehow till I bought concord grapes a couple of weeks ago. They’re so good they’re my new favourite dessert… till I try this focaccia, I’m sure. I’ve made this at work quite a few times and never bothered seeding the grapes. The seeds give a wee bit of crunch, and the time savings is worth it. And as long as you’re on a grape kick, make her concord grape sorbet (or bug me for my variation with niagra grapes) – delish! Oh my YUM! I’m going through my “bread phase” right now and this is definitely being added to the list. It looks out of this world amazing! And the color of the grapes is awesome! Seedless Concord grapes exist?? My life now has a purpose. And Deb, while I agree it’s ridiculous for ketchup to be advertised as “fat-free,” the “100% juice” label actually does convey information. A lot of drinks advertised to kids are mostly flavored syrup. I always look for “100% juice” on the front before I’ll even pick up a juice, and then I check the label to see how much sugar there is and whether the juice is from concentrate. i have a question. . . you said use the paddle attachment but in your picture you show the hook attachment. . . which do i use? i think i am going to make this and even though i am a avid baker i have never worked with active dry yeast. so i am a little nervous but i think i will finally do it! Wow! What an unusual combination – I would have never thought to put grapes on focaccia. Can’t wait to try it! Deb, I love your pet peeve. I’m an FDA lawyer, so I spend a ridiculous amount of time explaining to people what they can and cannot say on labels and where/how all of the info must appear. Believe it or not, most label claims are actually based on FDA regulations, which helps explain why they are so ridiculous. “Good source,” “Contains X,” “Provides X” = 10-19.9% of the RDI; “Excellent source,” “rich in” = 20% or more of RDI. Free, low, reduced — all are defined by statute too. Juice names are the most absurd; “pomegranate blueberry flavored juice in a blend of five juices” is just one of the many reasons my clients hate me. I could go on for daaaays because I am a huge dork about this stuff. jarelle — Later in the same paragraph, you are to switch to the dough hook. Kate — Continue! I want to hear more! I mean, I knew it was legalese but the loopholes, they’re so large that apparently eating Rice Krispies is akin to getting a flu shot while bathing in Purell. At the Union Square Greenmarket on most Wednesdays and Fridays the past few weeks there are farmers selling seedless Concord grapes and other seedless American grape varieties. This recipe with the pics sooooo puts me in the mood for fall. I will be making this asap. I have used used olives in bread but not grapes. Very nice photography! Hi Deb, First time, long time (as a radio caller might say) – I’m smitten with your site, words and photography. I just purchased the lens – THE lens- and have a new relationship with food. I didn’t know I could be seduced by a leaf of lettuce until I looked at its veins through the Sigma. Thank you, but not why the comment…I believe like you that despite your grape encounter that most packaged foods that claim health or real, sadly are neither. Even the ingredients are fractioned off so that sugars and preservatives don’t rise to the top of the ingredient list. The bigger the claim, the more likely the charade. You were not wr,r…I won’t say it – but, perhaps it’s lesson to keep an open mind that some packaged foods can be true. And with that, I am going to try the concord grape…thanks for the inspiration. i am making these now. RIGHT NOW! Ummm..how did you KNOW I just bought fresh rosemary??? Now I just need some grapes! I’ve been avoiding your mouthwatering photos and blog for the past three weeks due to being on a cleanse. I’m back with a bang, and can not wait to make this! YUM!!! Looks so amazing. Love the sweet/salty/herbaceous combination. I too remember the first time I ate a Concord grape. It was like a light bulb went on. “Ohhhhhh. I get it now. Grape juice isn’t made from table grapes, it’s made from Concord grapes. Duh.” And as much as I love the flavor, I have no patience for the seeds and am content to line Welch’s pockets to get my fix. Love this combo!!! It looks amazing. We have these type of grapes growing in our yard, and I mostly just stand out there and eat them. Lovely to have a new idea for them. They are actually easy to grow – and we have a very short growing season here in Maine. We sort of don’t do anything and they keep coming back, with the exception of having to fight off the Japanese Beetles that seem to love them! I’m a bit of a fan with focaccia so I know I’m going to love this recipe. If you are not inclined to seed those concord grapes, King Arthur Flour has a recipe for a Grape and Rosemary Focaccia where they roast seedless red grapes in the oven. It’s also a soft dough and I have made this with good results. Having said that, I am going for the concord grapes this weekend. I saw them at the Farmers Market and I am interested in comparing the two versions. PS. I’ll bet your mailbox is overloaded with Sox Monkeys….I know I am tempted!!!! When I saw this recipe today, I knew I immediately had to make it– not because the combination sounded amazing, but because I couldn’t imagine any universe in which cooked grapes on focaccia could be a -good- thing. I had some red grapes in the fridge that were getting a little too close to being inedible, so I figured, why not? Several hours later, I have two loaves fresh out of the oven and they’re amazing! I’m having an off day and managed to burn the bottoms of these a bit (as well as screw up some pizza dough I made earlier), but they’re still delicious– just kind of toasted. Does anyone have any idea how long they might keep? My concern is that the grape juice pooling in the middle will make it soggy. Also, to anyone that’s wondering how the recipe will turn out using seedless grapes– I used your average seedless red grapes you find year-round in the grocery store and it’s wonderful. I had a similar epiphany after eating some “real” grapes. I love concord grapes – particularly their gelatinous insides. I can’t get enough of chewy, sweet things. Love it when things come together that probably shouldn’t! Eating Vosges chocolate infused with coconut and curry at the moment and it’s turned out to be a GENIUS combination! I had the same experience with grapes last year!!! I always thought that grape juice tasted like grape flavoring, I had no idea – and hearing that someone as knowledgeable about food as you makes me feel less silly for taking so long to figure it out! My first thought was, “Could I just smear some grape jelly on my focaccia?” But if there are seedless Concord grapes, I might try it. And that sock monkey photo? I think that the sweetest picture ever! I would have run right out to buy him his own sock monkey! I’ve found the same thing with strawberry flavoured things; Strawberries in Australia taste nothing like strawberry ice cream etc. But recently I was in the UK at the end of summer and the strawberries there tasted exactly like the flavouring I had always assumed was synthetic. I was going to suggest something similar to Russ. I know that at the GAP market on Saturdays, there is a huge grape stand that has seedful on one side and seedless on the other. There are definitely seedless ones that have the same flavor as the Concords (not quite as intense–seedless are always less-strongly flavored), but i don’t remember the name of the precise variety. Don’t waste your time with Thomcords, though, they taste just like Thompsons…and just as industrial, in my opinion. I’m so glad I’m not the only one who had the grape epiphany after eating a Concord grape. My sister-in-law usually has 50 lbs or more of Concord grapes growing over her backyard fence which my hubby harvests for her so we get the bulk of the pickings. I usually make jam (more jelly like because I use my food mill to get rid of the peel and seeds) but last year I made grape juice which over the summer became grape sorbet – yum, yum. But this looks like a wonderful new grape recipe to try – if we get any grapes at all this year out here on the soggy wet (west) coast. And your sock monkey thief is just the cutest! Still waiting for the concords here in Ontario. I used to make strawberry and raspberry jam every year…I even made blueberry a couple of times. Last year, for the first time, I made concord grape jelly. I decided, from then on, the only jam/jelly I’d be making would be grape, and concord whenever possible. It truly tastes like Welches (only maybe a little nicer, if that’s possible)!!! I must say, I’m shocked you only tried your first concord grape this summer. How did that not happen sooner??? Anyway, I’m fascinated with this recipe and might just give it a shot! Stunning Recipe! I have never tried sweet focaccia. This recipe looks appetizing just by looking at the pictures. This is a great recipe, a lot of our grape crops were ruined this year due to the fungus growing and so we expossed it and got a huge heat wave and killed many of our grape vines, this goes for all of wine country not just us, not sure how the season is gonna be. but our concord grapes that we have just for baking are fine and we have plenty so I’m gonna try this recipe out it looks terrific. Forget focaccia you need a slice of my Granny’s concord grape pie! Try seeding and peeling all the grapes for those babies. Hours of labor produced several fillings to be frozen in pie pan shapes and saved to bake for very special occasions. Say, Granny’s birthday when my mom, uncle, Granny, and I took two cuts to the whole pie and each ate a full quarter warm and al a mode! Heaven like you’ve never known in a pie. Isn’t it funny? I recently tried fresh concord grape juice at the farmer’s market and was transported back to my youth with that first grapey sip…it’s crazy! Gah, I don’t know if there are enough hours in the day for all of the things I want to make or read or eat! i don’t suppose i’ve ever had a concord grape either, but i do agree that most of the “juices” on the market taste nothing like the fruit from whence they came. maybe this is an exception? I chuckled wihen I saw grapes, thinking “Oh, yeah, right” with much sarcasm. However, after reading your raves and rants, then checking out the cookbook, I thought this girl is onto something. So, this is my next baking adventure and someday hope to buy or receive as a gift (preferably) the cookbook-Last Course. Being a Californian, grapes are in abundance locally from table grapes to Cabernet. Maybe an experiment is in order with different types of grapes ones without seeds. This looks like the most perfect thing ever! I do a good foccacia and love dunking it into cream of tomato soup. I’ve been wanting to try making butternut squash soup. I wonder how that might pair with your gorgeous foccacia. tonight’s the night! I wonder if a tomato shark would get the seeds out easier and quicker than a paring knife. You might lose a bit more pulp than when using the knife, but the time savings may be worth it. OMG!!! My mouth is watering. These look sooooo good. I want to eat these up ! This sounds fantastic. I’m making it next week. And yes! Concord grapes are crazy! My husband grew up surrounded by Concord grape vineyards (which, incidentally, supply for Welch’s) – he and his brother and dog would eat themselves sick every fall in the backyard. Early on in our relationship his parents brought us a basket of grapes when they came to visit and I was flabbergasted – they tasted like grape bubblegum. It was, exactly as you say, a revelation. The answer to a lifelong question. His mother makes grape pie – I’ll have to ask her how she handles all the seeding. I think she boils them first and picks out the seeds – which would be of no use here. This is like Schiachiatta con L’uva….an Etruscan grape bread made for the grape harvest in wine country in Italy. I made it last year, inspired by Sullivan St. and Grandaisy’s pizza w/ champagne grapes. Your focaccia is beautiful, I may have to stop being afraid of yeast! I’m a bit of a grape nerd, so here’s my 2 cents: The white grape juice you see in the stores is made from Niagara grapes. They have the same grapey flavour, but they’re a white grape. I’m a wealth of useless information sometimes! My husband planted concord grapes last year and we have been so enthralled with their sweetness, after this very hot, humid summer. He has been after me to make something with them, now I know just what to do! Thank you!! It makes me smile to see a circular focaccia cut into squares. When that’s done to a pizza in the Midwest (VERY common), it’s sometimes called a party cut or a tavern cut. Oh my, the flavors in this focaccia! Wow. Though I am a faithful reader of Smitten Kitchen, I never felt the need to comment until reading about your reaction to eating a concord grape… I had the exact same reaction. I had come to think of concord grape jelly as this unhealthy, processed product with absolutely no trace of natural ingredients, and then I ate a concord grape. And my world was turned upside down. Actually, I must admit that the association was so strong, I couldn’t bring myself to eat more than one of the sickly sweet grapes; perhaps I’ll have to try this recipe and put a different spin on it! Thanks for such a consistently interesting blog. @SoupAddict – GREAT tip! The tweezers made it a snap! Deb, I have you to thank for now being addicted to Concord grapes. It took all my restraint to actually save 1.5 cups for this recipe. The focaccia is in the oven as we speak, I cannot wait to bite into it! Hi Deb – Can this be frozen? If so, would you recommend baking then freezing, or freezing it unbaked? Thanks! I know what I’m making this weekend. Thank you for another great recipe Deb! I love the unexpected addition of grapes to this normally savory food. Rosemary and grapes, sounds delicious. And as for food companies…you are not wrong. They get away with way too much. Agreed. Concord grapes taste like juice. I had the same experience! “Lush glass of pink wine.” So funny! Can’t wait to try this recipe. We made this last night, cutting back slightly on the sugar and the salt. This tastes as beautiful as it looks, like flowers and poetry and the end of summer and the beginning of a new year. So thanks so much and shana tovah umetukah! and I really want to try concord grapes now. I made this yesterday and literally–no kidding–ate one of the two loaves entirely by myself. It was UNBELIEVABLE. Wowza. I just came upon your blog in a search for lobster rolls. Oh dear. And here I am trying to diet. LOVE it ALL! Cheers! I had exactly the same experience. As a European, anything grape-flavoured always tasted exactly like the Welch juice, which when I first tried it I couldn’t believe to be actually fruit-based. I still cannot trick my mind into thinking that the grapes actually naturally taste fake. Alas. I have been looking for some ‘proper’ grape juice. If nayone has any advice, I’d be thankful. I had to post this. I live in northern California, and I saw seedless Concord grapes in thw store today! Sorry, I forgot the name of the store. It’s Safeway. (I realize this is not really the forum for this and apologize profusely.) I actually had a question about FDA labeling that I was trying to get in touch with someone about (to no avail– I am no longer a journalist and feel awkward calling people dozens of time to get a reply for a personal project). If you wouldn’t mind exchanging a couple of emails, please shoot me one at deploy.solutions at gmail dot com– and if not, that’s absolutely fine, but it never hurts to ask. Also, I find reading FDA legislature to be immensely enjoyable and deeply regret my film major. Nerdery FTW. More on topic: I made this recipe a couple of nights ago and even my picky boyfriend enjoyed it. Definitely try this if you haven’t. I love this combo of flavors and so agree with you about labeling. I am so going to have to try this one out. Thanks for the great post. I CHICKENED out yesterday in the store- went to an indoor green market and there were a few lonely Concord Grape containers. I lifted 1 up to examine the contents and left them in the store. Sadly, I was feeling just too LAZY to pit the grapes! And usually tasks like that don’t really get to me! Just a tip for those mixing the dough by hand: for high hydration (sticky) doughs like this the easiest way to handle and “knead” them is with wet hand, not floured, and by folding. Get your hands wet all over, scoop or pour out the dough onto a wet surface, using your hands or a bench scraper (much easier) scoop up half of the dough and fold it over. Keep rotating the dough and folding. Occasionally pick it up and let it stretch out to fold it more easily. If you do this for about 5 minutes it kneads it really effectively, and I think it improves the final texture of the bread. I had to smile! I was born in Australia and had never ever eaten a concord grape (as far as I know they are not imported or grown there). We did however have grape sherbet sweets which tasted nothing like any grape I had eaten. Until last fall in new England when I had my first concord. That is the flavour of the grape sweets!! what an intriguing flavor combination… this marks superb chef skills and a recipe i can’t wait to try! I had my first concord grapes just last year. And I will never eat another ‘red’ or ‘green’ grape again. Concord grapes are bursting with flavour! I have made dozens of recipes from your website and they have ranged from amazing to divine. I have a hard time choosing a favorite, but this was as good as any of them. This recipe worked very well. Instead of concord grapes, I used champagne grapes which are milder. I hope I didn’t lead anyone on a wg chase with my tip about Fleming’s book. I just received the Wrong book by the Wrong author. So sorry for the misguided directions. This is a very pretty treat. I love to make them. My family loves them, too. I always get the comments form my family like, why did it take you so long to make them again? I like to mix things up a bit, that way my family thinks that it is hard and special. I’ll be giving your focaccia a try, soon…thanks for the inspiration! Got flame grapes and figs in this week’s farm box, so clearly two batches of this was needed — one with grapes, one with figs. I just pulled the second batch out of the oven. I can’t speak to the fig batch yet, but the grape is AWESOME. The salt and rosemary with grapes is fantastic! Just made this, and it is indeed delicious. Being a huge fan of rosemary, I actually wanted a little more of that flavor – I think next time, I will chop the rosemary and mix it with the bowl of seeded grapes and let them all hang out together for a while before spreading on the dough. There are different gourmet seasonings and recipes out there. This is an interesting combination. There are so many ways to be creative when cooking. This looks not only delicious, but beautiful. Somedays I’m not sure which I love more, your food or your photographs. I now have a new use for my rosemary, the sole survivor in my pathetic little garden! I grew up eating concord grapes straight off the vine so I have always loved Welch’s grape juice. There is something better though, homemade grape juice poured straight out of the mason jar. I LOVED the week when we couldn’t eat at the table because it was covered in mason jars and the big juicer that looked like a big barrel with a long hose. I loved watching that purple juice go through that hose and into those jars. Plus, it was always amazing when Mom would pull down a jar at dinner. She rationed them so they would last all year until she could can more. This looks/sounds FANTASTIC! I would love to try a similar recipe and use blueberries instead of the grapes, I make a blueberry pesto that would be absolutely killer with a modified version of this focaccia bread. This sounds like total heaven; I wish I was eating it right now! Deb, just wanted to tell you I made this and it turned out AMAZING! Thanks for such a unique inspiration! Great recipe – I made it and it was wonderful! Very original, I got a lot of compliments. Hi Deb, your blog is wonderful! Is it possible to make this dough ahead of time? I’d love to bring it to a dinner this week, but won’t have time to make the dough (silly work!). Thanks! I was lucky enough to score some seedless Thomcord grapes at my local Publix. I ended up making a grape rosemary gorgonzola flatbread like the one I had seen here – http://www.wearenotmartha.com/2010/02/sausage-grape-and-gorgonzola-flatbread/. (I left out the sausage and onion and worked some fresh rosemary into the dough.) Soooo yummy. This was the first time I had eaten Concord grapes and I’m afraid I will never be able to go back to the regular old red ones again! Oh my goodness. Everyone else has said it already, but this was incredible. First off, the focaccia recipe is the best I’ve ever made, and was as good as the piece I had in Italy in a town that claimed to INVENT focaccia. The grapes on top were a stroke of genius, then the salt, sugar, and rosemary ties it all together. I only used about 2/3 of the salt on top, and next time I would cut it back to 1 teaspoon, but other than that, perfection. This is a special Tuscan treat when wine grapes are harvested. The Tuscans, of course, use wine grapes and don’t remove the seeds. My favorite had lots of sugar on top. The rosemary is essential and certainly the olive oil. Great that you posted this recipe. To me there is nothing comparable to concord grapes. They are DIVINE. Pesky seeds, yes, and tanin yes, but the flavor! Also discovered seedless concords this summer. They don’t have the same intense flavor and you still get the errant seeds but well worth it. Absolutely delicious!!! We had it with a glass of ice wine – magical! Thanks so much!!! kate: i’m a dietitian and am SO THANKFUL that you are out there fighting the good fight! muchas gracias! This looks incredible. Can’t wait to try it! I plan to make like the Tuscans and use wine grapes. oooo-eeeeeeeeee this looks amazing! Aren’t concord grapes a trip, who knew that purple grape jelly was actually (maybe) made from grapes. I’ve never cooked anything with a concord grape (just munch them as is), but this is a great excuse to try something new. btw, I LOVE your site. I swear someone made this for the artists’ open houses at the Invisible Dog in Brooklyn last week, and I had a slice & it was fiiine. Sadly, there was no one in that particular corner of the studio when I was there, so I don’t know who is your artist-reader, but it was immediately recognizable. After seeing this recipe I finally bought Concord grapes the other day. I had never had them, except like you as Concord grape juice. They are so interesting! Its like there is a little pouch of that distinct flavor in the center, filled with little seeds. Delicious, but I wish they were easier to eat without spitting every 2 seconds. Big fan of Smitten Kitchen!! Why bother seeding them? ‘Round these parts, we have muscatine grapes this time of the year, and I put them whole on top of the focaccia. Yum! Especially with some goat cheese and/or blue cheese. My friend and I are making this recipe in conjunction. 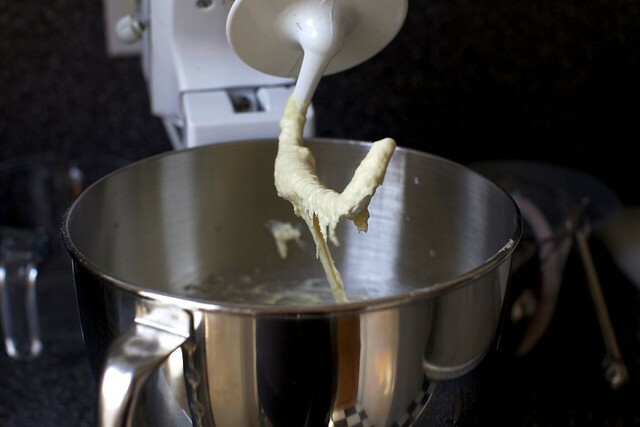 We both have Kitchen Aid mixers, and neither of us could get our dough hooks to really throw the dough–the hook just sort of whirled around in the top part of the dough without ever pulling the dough off the sides or bottom of the bowl. When we use a less sticky, heavier dough, the hook really picks the whole wad of dough up and smacks it around inside the dough, effectively kneading it. I recommend kneading this by hand if you’re having the same trouble kneading in your mixer as we did. My friend ended up kneading hers by hand, but I put mine in my oiled bowl to rise, just to see what happens if I follow this recipe word for word. I’m looking forward to seeing what happens. I had the EXACT same experience with concord grapes this year. I had been snorting at Welch’s for so long, and more recently expressing my disappointment at Alton Brown for selling out to advertise something that was so obviously NOT 100% grape anything. And then, yeah, concord grapes. Humbled. We’ve been getting them in our CSA for the past couple weeks–totally making focaccia with them, and soon. I made this last night and it was delicious! I do not have a stand mixer, so I made it by hand (skipped the kneading, the dough was wet enough to just give a few good stirs). We have dairy allergies in my family, so I also skipped the milk (used water). It still turned out perfect, tender and delicious. No concord grapes, but my grocer had some delicious local, seedless red that were very sweet. I’ve made a similar version if this with blue cheese and honey (added after it was cooked) – that was good, but this one was better. Thanks for the recipe. I made this last night and it was amazing. I made the dough by using the “dough” setting on the breadmaker and it was spectacular. That was a lot of salt, I used the whole mixture on my first batch and it tasted much too briny. I’ve been able to get much tastier results in subsequent batches on half as much sugar/salt, maybe even a quarter. Thanks for the recipe, it’s a great simple bread! Yum! Made this last night and I can’t eat any until my hot date comes over tonight….or can I? Anyway, great recipe. I couldn’t find concord so used black, and they just aren’t going to be the same, (nor did I toil over the seeds, which seems like part of the deal ;-) My mistake? sprinkled the sugar on the bread and spilled a little on the pan…450 in the oven is hot enough to burn the sugar on the pan and sure enough ;-( the smoke alarms went off! Silly tinytim! I made this on the weekend and it turned out GREAT!! I’m getting requests for more. When I looked at the pictures again (just now) I realized I could have used a whole lot more grapes. We do have concord grapes in the store right now, but won’t be for long, so I’ll have to make more soon. My bread rose more, wasn’t as flat as in the pictures, but still was soooo….. good! Love your site! We have guests coming over Friday night, and I’m working until 4. Is there any way to make this ahead of time? Can you store the dough overnight at some point in the process? You can make any bread dough in advance and keep it in the fridge for up to a day. Bring it back to room temperature and resume where you left off. It helps to put it in there as you begin one of the “rises”. This was AMAZING. and, yeah, pretty much impossible to not eat the WHOLE THING in one sitting. Thanks for sharing. I served this at a cocktail party this weekend and it was a huge hit! Thank you so much for posting this. I always find such fantastic ideas on your site as well as recommendations to make the best possible version of these dishes. Thanks for making me look like good – again. P.S. I used a mixture of whole wheat and standard AP. I think it gave it a very nice rustic character and nuttiness to go with the grapes. I’ve been browsing your site for a while now. When I saw Concord grapes at the market on Saturday, I decided to try your delicious looking focaccia recipe. All went well until I tasted the finished product which was curiously very salty. Turns out what I thought was coarse sugar was actually salt. I’m so bummed. Some how this has to be my husband’s fault. Right? I had an abundance of concord grapes from my CSA, and this was the perfect way to use them. The focaccia is delicious. I did cut the salt a little bit and next time, I would reduce it to 1 teaspoon. I love the sweet and savory combination. It is especially delicious when topped with a little ricotta and drizzled with honey. I had the same Concord grape-iphany last fall, when I had a concord grape pie from a little cafe in Brooklyn. I bought a bunch for my daughter this year so she could experience it for herself. She prefers “different grapes”. More for mama, I say. I will try this recipe. It looks outstanding. Deb, do you read xkcd? If you don’t, you should – I think you’d love it – but that’s a separate subject. Either way, this (http://xkcd.com/641/) reminded me of this post, especially the whole FDA discussion in the comments. Enjoy! My name is caroline and i’m french. Excuse me but I don’t speak english very weel , i learn !! I want to say you your blog is beautiful and especially your pictures ! Thank you for yout hard work and keep it up ! Read this recipe a few days before going to mom’s farm – where she grows Concords amongst other things. Somewhere in between eating them off the vine we made a batch of the focaccia – Delicious! No dough hook so used a wooden spoon to whip it for the 8-10 mins and eventually had to add about another 1/2c of flour after the first rise to make it anything but runny (although still not really kneed-able). I would also use fine sea salt flakes and cut the amount next time – but there will definitely be a next time! I have been keeping my eye out for concord grapes (I live in the PacNW), but have yet to come across any around here! Do you have any suggestions, as far as substitutions go? Yum! Just made my third batch of this! I didn’t seed the grapes though, and it is still seriously tasty. i discovered concord grapes a week after reading this post, and was reminded of this recipe. It was as delicious as it sounds, especially if you like the sweet/salty combo. Thanks for a great bread recipe Deb! made this last night the lazy way – i had some fresh pizza dough and used that instead of making the dough myself. and it was delicious! next time i will make it the real way. Waaaaaay too salty! Such a disappointment, after seeding the grapes, waiting for the dough to rise. The salt sprinkle overwhelms the sweetness of the sugar and ruins the entire recipe. Cut is down by 2/3 at the very least. Long time S.K. addict, first time commenter… I used roughly 1/2 the amounts of salt and sugar sprinkled on top. Even then, it was a bit salty for my taste, but that may be due to my use of kosher rather than sea salt (?). Overall, YUM! The first round was gone in about 5 minutes. I had the same grape epiphany- what a joyful experience (“Hey kids, come smell these grapes!”)! I did, however, have to rig up a crazy towel set up to “cover” because even with the olive oil smothering the dough, it stuck like the dickens. I am making more because, what else can I do with these beautiful grapes?! I also thought it was way too salty. I couldn’t believe I had to toss it after all that work, especially seeding the grapes. Really looked forward to it and at first thought I had not followed the recipe correctly but, no, I had the right measurements and even used the coarse sea salt on top. And I usually like the salty sweet combo but the salt was all I could taste. Couldn’t even convince my husband to take more than one bite. So, seriously, all of you who liked it used that same amount of salt? So disappointing and left such a “bad taste in my mouth” that I doubt I would even try again with modifications to the salt. Sorry to hear that some are finding it too salty. I actually did find it salty, but also sweet and loved the way the two contrasted each other. In my version, they were in good balance. Question: What kinds of salt are you using? Swapping, say, a Kosher salt for a sea salt can make it much saltier (especially if you are using Morton). A fine salt will give you twice the saltiness of the same volume of coarse salt. And finally, a fine table salt (i.e. all table salt) will be much saltier than the same volume of fine sea salt. I’d love to clarify if it is the ingredient, or the recipe. Thanks. i’ve made this tree times now. deb, wonderful. i have not encountered a disgustingly salty taste. i’ve been using rock sea salt that’s very coarse. i’ve been crushing the sea salt with a spoon before i measure, so it isn’t too chunky. i have enjoyed the sweet/salty combo (obviously, 3 times ha ha) and never been disappointed. i’m also thinking that table salt may be the case here. Made this for a dinner party over the weekend. We easily put both loaves away with only four people. After reading the comments above I made sure to use a coarse sea salt and didn’t find it too salty at all. If anything it was a touch too sweet. I had a hard time sprinkling all of the sugar/salt mixture on top and only used about 2/3. Next time I think I’ll just halve the sugar/salt mixture. Also, next time I might double the recipe and use grapes on half and olives on the other half. I’m curious if anyone cooked this directly on a pizza stone. I was tempted to but worried about the olive oil soaking into the stone. By the time I thought to put it onto parchment it was too much work. Maybe next time. Hi – This is beautiful and I’d like to make it with dried cranberries for my small child’s class party next week. Do you think this will work? Also, how many would you make to feed 30 pre-school children? I’m guessing 2 or 3? Thank you! I’m reading this from a chilly dorm room in Washington DC and yet somehow your descriptions of pumpkins at farmers markets and cardigans night night have called back a rush of memories from the end of this August, right before I left New York for college. You capture that late summer feeling so perfectly it makes me homesick. Not to mention the fact that my dorm kitchen’s oven is far too cantakerous to allow for anything as gourmet as baking bread and I don’t have nearly have enough money in my bank account for the concord grapes and rosemary necessary to make this foccacia properly anyway. Next summer, perhaps, when I’m still in New York and my mom’s paying. yes that looks simply amazing. and the grapes! —wow. unbelievably gorgeous. I had the same revelation about grape flavour the first time I ate concord grapes. I recently tried another fantastic not-your-run-of-the-mill grape. They were labelled “pink grapes” and tasted delicately of dessert wine. They have an odd, slightly granular textured flesh, like eating granita. They are more spherical and are more of a greenish colour with rosy highlights than outright pink in colour. Looking at grape photos on the internet, I think they might be Iona grapes. WOW! this recipe is delicious! I couldn’t find concord grapes (it’s only April after all) so I used seedless black grapes. The grapes are not nearly as sweet as concord so I used about 2/3 of the salt instead of the full amount in the recipe, specifically fleur de sel. I also used a bit more rosemary. Probably one of my favourite recipes in a long while, thanks so much for posting! And thanks for the ‘surprise me’ button that showed me this recipe. Don’t know if I am going wrong somehwere but mine swells like 2 inches thick after baking. It never looks thin like yours :-( but very very tasty! I made this during the weekend but I topped it with Pear, Rosemary and Goat Cheese. It was delicious!!! Love the foccacia recipe – i like it better than regular foccacia since this is almost like flatbread or pizza doug. This dough made me cry just a little. It was so sticky that even though it was generously coated with olive oil, for the second and third rise it kept sticking to the dishtowel! I finally got it into the oven, but it suffered a lot of abuse. I hope it comes out ok….how can I keep the dough from sticking to whatever I’m covering it with? I’ve never had this problem with pizza dough! This is absolutely delicious! I made this last year for a Fall party and it was devoured. I cannot wait until concord grapes are available this year so I can eat this with a lovely glass of wine. I made this bread with cherries instead of grapes (Martha Stewart’s idea) and it was heavenly! I made it as a snack and we ended up eating it for dinner because it was so delicious! So I read this recipe a whole year ago on your blog and never forgot about it. And then on Friday I was at the 97th street Farmer’s Market and I saw baskets of concord grapes and I knew I had to make this. I ignored all the signs telling me that today was not my day – after proofing three envelopes of yeast from two different envelope trios (am I making sense?) with no foaminess and then going to TWO different Gristedes’ and finding only rapid rise yeast, which I finally bought and proceeded to proof with verrrry minimal foaminess until I just said, to HELL with this and proceeded, because how can it be possible that 7 envelopes from 4 separate packages are ALL DEAD?! – I moved on to seeding, which took about an hour that I no longer had because of all the time I had wasted on the yeast, etc. etc….. Long story short, I was elated when this came out of the oven, and it was perfect. Everyone l.o.v.e.d it. Probably more than me, actually – turns out these grapes are not my fave. But it was gorgeous and I found the balance between sweet and salty to be perfect – I used table salt in the dough and sea salt on top, and I didn’t have raw/coarse sugar so I just used regular, which might have sweetened it a little extra but worked for my crowd (and by the way, there were small children at my shabbat dinner table and they loved this too). YO. We tried it — bomb. Flavors here were good, but mine turned out more like pizza dough than focaccia. Was kinda disappointed after seeding all those grapes. I’ve made focaccia before, and the texture of this dough was not the same (mine was not sticky at all…maybe too much flour?). I plan to make this again, because the flavors are dynamic, but this go ’round was a bust for me. I agree, not exactly the focaccia I was expecting. Mine did turn out looking like the picture though. I even added 6 tablespoons of olive oil to the dough right off the bat by accident. Whoopse! I also needed to bake for more than 15 minutes to get brown, more like 35 in my oven. I think the high heat probably had something to do with it too…Excellent flavors and I’m going to try again! I made this bread a couple of weeks ago when I happened on some seedless concord grapes at the farmers mkt. Yes! Seedless..very handy. I liked it okay..the grapes were really sweet and reminded me of grape jelly on a rustic pizza crust. I cut back on the salt a bit as I’m not a big salt user anyway, but left enoughto contrast the sweet/salty thing which I really liked alot. I came across a bread called Schlotzsky’s Bread that is apparently from some chain deli that I’d never heard of, but I was intrigued by the name and impressed by the comments of the cult followers! It’s a batter bread focaccia, but uses milk as part of the liquid and is baked in two pie or 8″ cake pans so rises taller and is split to use for sandwiches. It’s crumb is like the no-knead bread; chewy and porous. I’m going to try that with the grapes next time I find them. 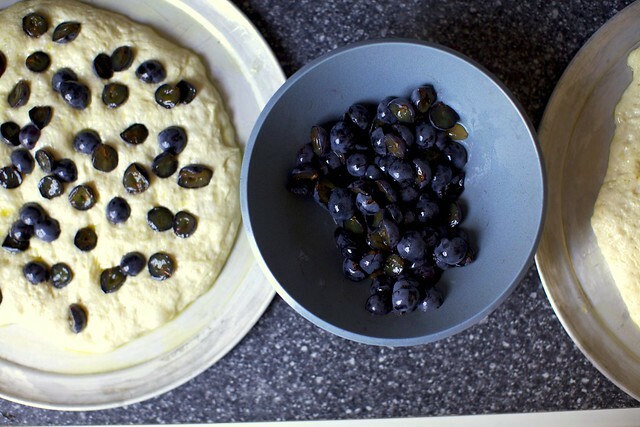 This came up in my search for focaccia with grapes and it’s the best recipe I’ve seen! Phew.. 3 hours later and the focaccia is out of the oven! It does not look nearly as amazing as yours, and I really struggled with the recipe. I only had 1 cup of AP flour, 1/2 C of bread flour, and 1/2 of wheat flour, so that’s what I used. Then I accidentally added all 6 T of oil at the beginning. I tried to get most of it out, but ended up taking some flour with me, so I think the dough was stickier than it should have been. And those concord grapes! Oh my lord! I gave up and just had most of the skins and insides separated. I made one with just rosemary, and added the grapes to the other. Honestly, I’m not sure about the concord grape flavor. I’ve never been a fan of that type of grape flavor- I always thought grape juice and concord grape jelly tasted so fake! This was my first experience with a concord grape, and I now realize… that is just how they taste! Anyways, the focaccia is still delicious, but I don’t think I can go through the hassle of concord grapes again. Maybe I’ll try a different grape next time. Thanks for the recipe! Well, I’ve got this focaccia in the oven! I don’t currently have baking sheets, so instead of making 2 round focaccias, I pressed the dough into a big rectangular cake pan. No idea how it’ll turn out, but the dough smells good. I think I might’ve made a mistake along the way, because my dough is on the dry side…more like a pizza dough than other focaccia doughs I’ve worked with (and admittedly I was in a hurry while making the dough). It sat in the fridge for about 12 hours before I was able to come back to it, but it was already pizza dough-y before that. No rosemary on hand, so I used thyme. Also, lots of extra grapes. Yum, I hope! Let’s see what happens! Mmm! The pieces on the edge turned out especially well. Oh…and I used pitless grapes on sale at the store called “blauwe druiven” (they’re not red or white grapes, but a dark purplish color that looks similar to the concord grape), so not sure exactly what kind of grape that is. I might try to make this again in the fall when more of the strongly flavored wine grapes are ripe. Oh yum! I made a version of this for a food and film blogger club (the movie was Sideways). I used red seedless grapes and added pine nuts, and I served it with fresh ricotta cheese that I made myself. To die for! I ate both rounds by myself (spread over 2 days), lol. I just made this after dreaming about it for a year…..added all 6 tablespoons of EVOO in the beginning, only let it rise for an hour total and used thyme instead of rosemary. I thought it might be a disaster but it was still DELICIOUS!!! And even though de-seeding those grapes is awful, it’s sooooo worth it! Made this in the food processor, and the dough came out great! Used the dough blade and processed for about a minute until it really came together. Just a tip for those without stand mixers. Incredible recipe that I make every year in late summer. Canada grows a variety of grapes called coronation which have a similar flavour profile as concord but are smaller (no need to cut in half) and seedless. They definitely make this recipe easier. been planning to make focaccia for ages now, but never got to it until now, and I’m glad I made first one with grapes, it turned out freaking delicious! I used grapes from family vine, no concord grapes in this part of europe but nevertheless it was worth all the wait! Loved this recipe! I had to add prob 3-6 more tablespoons of flour to my dough in order for it to not be so liquidy and to be the right consistency to clear the bowl. Yes, sadly, way too much salt. And specifying “coarse sea salt” is totally not helpful–even 2 teaspoons (1 tsp per focaccia disk–it’s a pretty small loaf, surface area-wise) overwhelms the sweet/tart balance. An entire hour seeding those lovely grapes only to have to throw away the result: very sad. You might add a note about the salt situation at the head of the recipe. Definitely want to warn eager bakers to think it through–seems as if, judging from the comments, that most people here haven’t actually tried making this. Hi Nadia — Sorry that you found it too salty. First, see my response/questions in Comment #281. Also, I will add a note up top now too. More: Salt is so tricky as no two brands or varieties provide the same saltiness per teaspoon and these issues come up frequently. However, UNDERsalted dishes are so bland and disappointing, I prefer to give a suggested amount and clarify the variety when I can, so there’s less likelihood of error. For the last two years, I slavishly devoted myself to the task of seeding grapes for untold hours, so that my husband and I could consume grape focaccia pretty much daily during the grape season. This year, we’ve got SEEDLESS Concords. Can’t wait to dive back into focaccia making and see how they work out. This is one of my favorite recipes, ever. Indescribably delicious, thanks so much for sharing it! Oh wow. I made this with the Concord grapes that grow in the park at the top of our hill and it was so amazing I’m doing it again four days later. I accidentally added all six tablespoons of oil at the beginning and mixed it in, but although it was sticky it still tasted great, so no worries if your reading comprehension is like mine. Hi Deb! I made this focaccia two days ago and fresh from the oven it was absolutely perfect. However, after just one day wrapped in plastic it became dry to the point where I had to toss it out. I’m just wondering what I could’ve done wrong that made it so dry. Just to let you know I kneaded it for 8 mins by hand in lieu of a dough hook, and refrigerated it before taking it out for the final rise. Maybe one of these things affected it? Or not using enough oil? Any help would be great! What a great day it was here in sunny breezy red and gold upstate NY to make this… It’s a beautiful adaptation, Deb. I’ve mad a lot of foccacia and usually I’m not a great fan because I just think it’s too ready. But this is crisp and just absolutely delicious. We’re having it for dinner with goat cheese and a tomato salad and well I haven’t quite figured out what else yet. For the last person who posted,I’ve found that any kind of delicate bread or pastry doesn’t do well being wrapped in plastic …you completely lose the texture. Try wrapping it in wax paper or even aluminum foil. PS… Seeding the grapes was no worse than peeling the chick peas. My only complaint about this was that it was so good I ate almost all of it before dinner… Made half with normal grapes and half with black olives – both were fab. And my 5 year old loooooved the feel of the dough – she wants to make it again, high praise indeed! this sounds great! if you dont see yourself eating the whole recipe immediately, could you freeze some of the dough balls and then bake as needed? jake — I think that would work just fine. Thank you! This came up as I searched for something to do with my Concords. So good, and yes, ate way more than I shoulda. Worth every carb calorie. I added coarse black pepper to both and just a little red pepper flake to one. There are so many places to go with this! My first time with focaccia, but not my last. There was a learning curve with seeding the grapes, and by the time I was done…no problem! I hope, since discovering this wonderful grape, you have enjoyed them on a more frequent basis. I discovered them because it was the closest to the grapes of my Southern childhood, muscadines and scuppernongs. Thanks again! Making the dough was straightforward – it’s a very wet dough. My dough is in its final rise, with half in the fridge for tomorrow or Friday, so I seeded only 3/4 cup of grapes. I’ll come back with a report on the outcome. Seeding the grapes was a major PITA. As described, the aroma was very much reminiscent of Kedem or Manischewitz. I found that puncturing the skin with the tip of my paring knife helped (even our ceramic knife squashed the grapes) but I was then frustrated by the tendency of the flesh to slip out of the skins. If I make these again, I’ll use a seedless red or black grape. I’ll lose something in flavor profile, I’m sure, but I’ll keep my sanity. Deb: Have you made this recipe since you posted it? StevenHB — Not in a while, but you should seek out TomCord grapes, if you can. They’re a slightly newer hybrid with the taste of Concord grapes but seedless. Well, it was really good (I used 1/2 teaspoon of kosher salt and 3/4 teaspoon of table sugar) on half the dough. I’ll use a full teaspoon of each on the remaining half and probably a bit more rosemary (how do you measure a teaspoon of fresh needles anyway?). Still, once these concords are gone, I don’t think that I’d be willing to use them again. I’m a committed cook (make my own stocks and clearly don’t shy away from yeast doughs) but the seeding was just too tedious and time consuming; though, they are tasty and beautifully aromatic. i’ve been dying to try this and finally have a bunch of concord grapes in the fridge! btw it’s called Schiacciata all’uva – Florentine grape bread, and the recipes i have don’t call for seeding the grapes – they say that tuscans like the crunch of the seeds! Many of the juices out there are 100% juice because they add apple juice. They almost never say 100% grape, cranberry or orange juice (the orange and cranberry juices are the ones I get caught on). I know as a child that I loved green grapes and was disappointed that grape juice didn’t taste anything like those grapes. September 2016 and this recipe is still a family favourite! Just made my first batch of the season, love this. Just made this again and I want to eat the whole thing. One teaspoon of Morton coarse kosher salt was the perfect amount for me. The last time I made it, it was indeed too salty. P.S. If I made this whole wheat (because, you know, I’m going to be eating a lot of it), what if any changes should I make? I made it this morning, with a teaspoon of dry rosemary in the dough and a bit of fresh on top with the grapes. It tasted delicious, but the grapes left the top of the loaf soft with juice when the grape skins broke. I wondered if you couldn’t fold the grapes into the focaccia and then drizzle the top with just the oil/rosemary/salt? I will probably try and report back! So excited to try this, and got out my knife for the cutting and seeding of Concord grapes, and it turns out that my grapes are “Coronation” grapes–like the Concord grapes, but no seeds. Even more excited now. I’d love to make this, but with two little ones underfoot, probably won’t have time to de-seed the grapes. Would regular “supermarket” red grapes work? Another fruit? Thank you! Yes. It will work, but concord grapes do have a different and unique flavor.